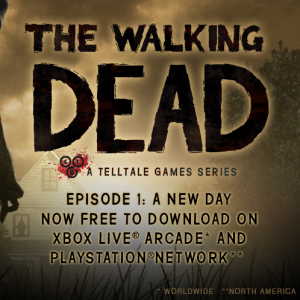 Telltale is now offering The Walking Dead: Episode 1 for free on PS3 in North America and worldwide on Xbox 360. Telltale's episodic take on The Walking Dead was arguably one of the gaming highlights of 2012, telling a shades of gray story of survival in a world taken over by the dead. While some were perhaps disappointed in the game's moments of linearity, many enjoyed it and became attached to its characters, especially protagonist Lee and his young charge Clementine. Now, perhaps hoping to expand on the game's success, Telltale has announced that it will be giving away the first episode of Lee and Clementine's saga, A New Day, for free on XBLA and PSN. Players interested in trying the game for the first time or perhaps replaying it on a new console, can now download a complimentary copy on the PS3 in North America and Xbox 360 worldwide. Players can also buy all five episodes of The Walking Dead for a new low price of $14.99 on PSN. Telltale's probable hope with this freebie is that new gamers will get hooked on The Walking Dead experience and buy the rest of the series. This, in turn, could also help raise hype for the second season of the game as well as The Wolf Among Us, a similarly styled adventure title based in the Fables comic universe. Telltale has promised updates on these newer titles in the near future. While I personally think Episode 1 is probably one of the weaker ones from the first season, it's still a great hook for the game as whole. In turn, giving it away for free could be a really smart move on Telltale's part that helps to expand the franchise to new sectors of the gaming community.